Printed tablecloths give your trade show booth a focal point so you can get your point across effectively. Our many options will help you create the right custom, brand-centric printed throws for your business. Tablecloths (also referred to as printed table throws) are printed on durable 8.8 oz. polyester fabric and are reusable. Keeping them clean is easy as the material is machine-washable. They are designed to easily slip over 6’ and 8’ tables.Spot UV Seals the Deal Spot UV is a special coating applied to a specific area to add shine and texture. It blends well with metallic ink. Use spot UV to bring attention to business logos or product information. Printed tablecloths are available in two styles: 3-sided and 4-sided. 3-sided tablecloths have an opening in the back so you can reach under the table where you’re likely to keep products and other items. 4-sided tablecloths keep your table looking neat no matter the viewing angle. Use custom tablecloths in situations where people can approach from all directions.It’s the right choice for graphic designers. Metallic business card printing gives them the chance to showcase their work. Your designs are printed in front of the tablecloth through a process called full-color dye sublimation. The process results in bright, eye-catching colors that’ll surely attract patrons even from a distance. Good to Know: Not only are tablecloths/table runners great for tradeshows, but they are also necessary additions to book signings and press conferences, as well as meet-and-greets. We have four size options: 126.5" x 62.75" (most popular), 126.5" x 84", 150.5" x 62.75", 150.5" x 84". How long can your printed tablecloths last? Our machine-washable tablecloths are made from durable poly-blend fabric and will survive multiple uses. How big is the custom tablecloth? Is it heavy? Our tablecloths cover 6’ and 8’ tables. Despite this, our printed tablecloths are lightweight and foldable. How soon can I get my tablecloth? Tablecloths can be printed as fast as 2 business days. Note that turnaround time does not include shipping time. Printed tablecloths are the key to inviting people to stop by any booth. There’s nothing more uninviting than a bare table. 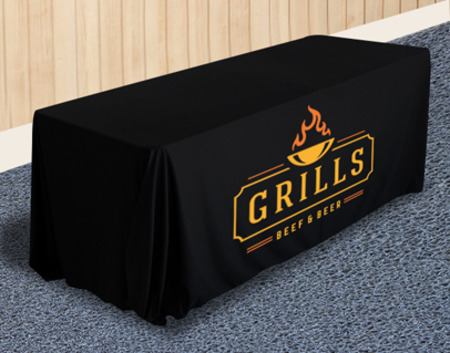 Create excitement with custom printed tablecloths. Keep it simple – A cluttered design will look amateurish which is the opposite of what you want. Choose the right style – If you’re planning to use the underside of your table for storage, go for a 3-sided tablecloth which has an opening in the back for easy access. Consider where you’ll be setting up – If you’re setting up in an open space where people will see your table from all angles, a 4-sided tablecloth might be your best bet.